Sometimes you want to draw attention to an element in a work of art. Unfortunately creating emphasis is often convoluted by fancy art-speak. 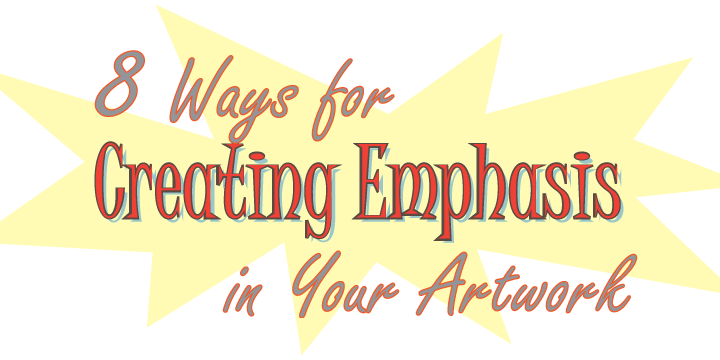 Here’s 8 simple ways to create emphasis that you can start using right now. Don’t worry, I won’t leave you hanging. 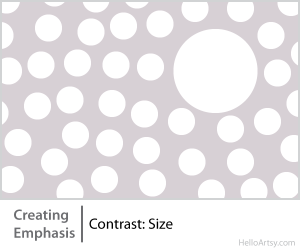 I’ll be explaining how you can use these categories to emphasize areas within your artwork. At the end of this reading you can download a printable infographic. Pay close attention to the illustrations that accompany each explanation. They are deliberately simple and as a result use simple shapes. This however, is merely the beginning. You can take what is learned here and apply the knowledge in far more complex works of art. When most people think of emphasizing objects within a work of art, they think of contrast. This is definitely a good start but even contrast can be broken down into several types (sub-categories). 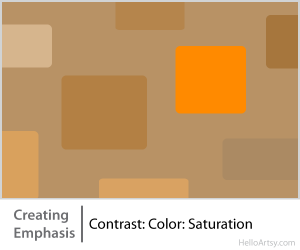 In other words contrast is not limited to light vs. dark (value contrast) but can also include the contrast between hues, saturations, patterns, and textures. Value is one of color’s three properties. 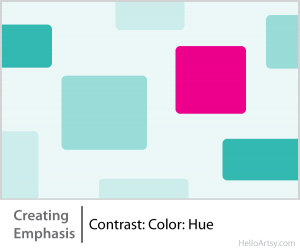 A color’s value can play an important role in creating emphasis. Need a focal point in a work of art? Make sure you draw attention to it by arranging your values so that you create the necessary contrast. 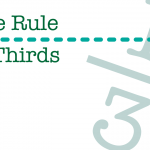 A color’s hue is also one of color’s three properties. Our eyes will notice any hues that are unique to their surroundings. Keep this in mind the next time you need to emphasize something in your painting. Often misunderstood saturation can play a very important role in drawing attention to elements within your artwork. 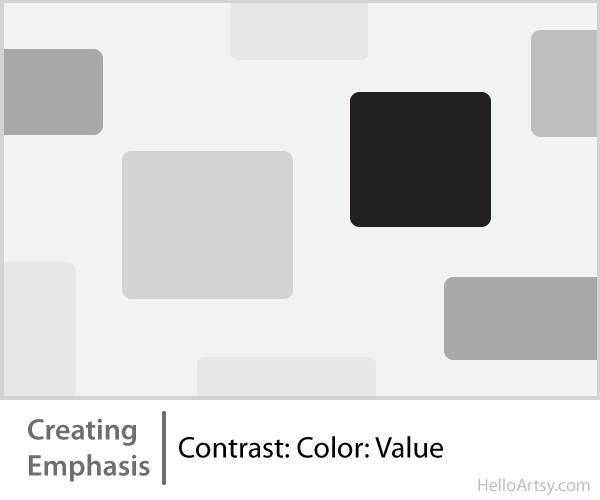 Remember it’s all about contrast… value and hue are certainly not the only way to emphasize things. Often overlooked aspects of artwork are the patterns and textures that occur naturally. While the example given is extremely simple keep in mind that many objects we come across in real life have naturally occurring patterns and textures. 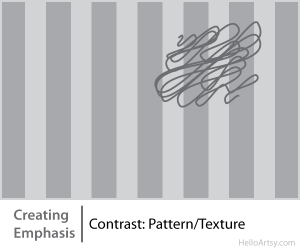 Learn to identify naturally occurring patterns and textures and you can draw attention by using a pattern or texture that contrasts. Sometimes size is enough of a differentiating factor to draw attention to something within your artwork. If you walked into a room and everyone was approximately 5 feet tall and amongst the crowd there was a 7 foot person would you notice him? 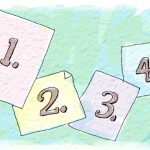 It may be one of the most obvious solutions but placing an element in the center of your composition will certainly draw your viewer’s attention to that central element. 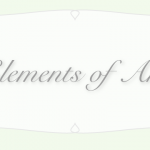 How you position your elements in your artwork can make a huge difference. An experienced designer knows how to isolate important elements in order to emphasize them. Art is a visual language and much like a written language we learn to “read” a work of art. Over many years of looking at artwork and making connections to the world around us our brain has learned to be directed by certain occurrences as being viewed in artwork. A character pointing with her hands might lead our eye in that direction. Perspective lines tend to make our viewers look into the illusionary distance. 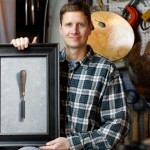 There’s bountiful ways in which a clever artist can direct a viewer’s eye towards an item that desires to be emphasized! I’ve been using fairly simple and abstract compositions to get my point across. Below is a still life illustration that uses several of the methods discussed to create emphasis. Where does your eye want to go to? What are the forces creating that emphasis? By now you can see that the design of this illustration was no accident. 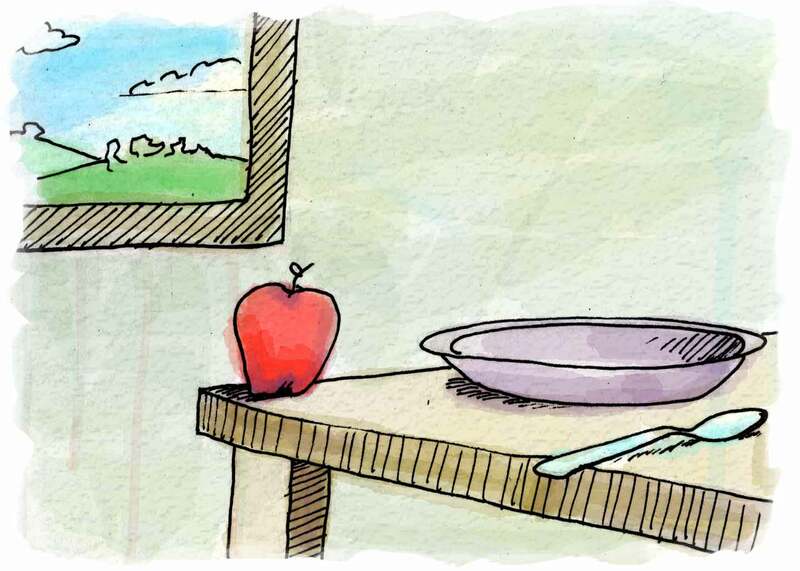 The color and placement of the apple, the angle of the table edges, and the placement and direction of the picture frame on the back wall…all planned! A deliberate attempt has been fostered to make the red apple the focal point in this artwork. Is Creating Emphasis Always Necessary? Do all works of art use emphasis? Jackson Pollock’s paintings are a prime example of artwork that thrived without the use of any focal points. 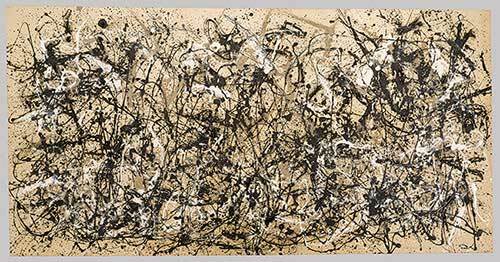 Pollock worked hard to ensure that nothing was emphasized in his popular drip paintings. Are you an art teacher? I have packaged up the educational illustrations in this post as one tidy infographic. It’s perfect for downloading to your computer and comes as an easy-to-print (pdf) so you can easily post it in your classroom or to give to your students. 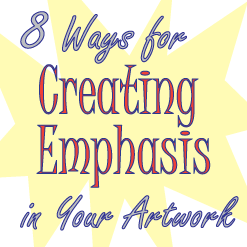 Enjoy this free downloadable infographic on the 8 ways for Creating Emphasis in Your Artwork. Don’t forget about all the other free resources on my resources page! Did this post help? I’d love to hear about it. Please leave a comment below. What about a different shape used for emphasis, I.e. A star surrounded by a bunch of circles. I think so Celia, the character of the shapes can certainly contrast! Good point. Thank you for the article! Before I get to my questions though, I will clarify that I am young and pretty inexperienced- learning as much as I can- and may have no idea what I’m bringing up lol. As I was reading I had some thoughts and questions on whether there is another form of contrast. Questions like, does all contrast in art have to be a visual experience- can it just be conceptual? Maybe the fact that art is a visual experience defeats the question, but maybe it doesn’t (which is why I ask) Art is a directly visual experience, but with our minds can it be more? Like how a painting can make one sad, an idea in it causes that emotion, and that emotion is very subjective from person to person. So could subject matter or emotion attention count as contrast- with aid of the visual elements you have described? Thanks! Yes art can be more than just the visual experience. I suppose I could contrast images of icicles with images of fire to give a really simple example. I could be a bit more abstract in the thought and contrast our expectations… This fur cup came immediately to mind: https://www.moma.org/collection/works/80997 My article here doesn’t address any of this stuff however. 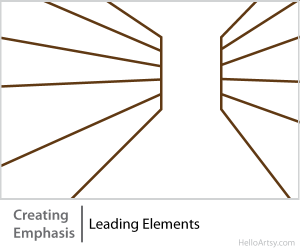 It’s emphasis (no pun intended) is merely on simple visual aspects. But I love the fact that you are thinking about this Brianna! I am mostly good at human figures, realistic is the easiest for me. Is it the same thing for emphasis?